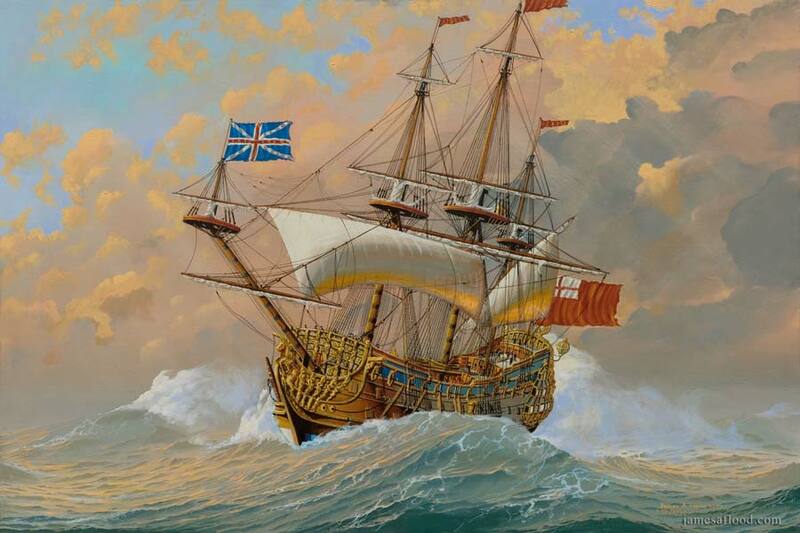 In this painting Charles II's magnificent flagship, Britannia is depicted battling a gale. Version II: Changes have been made by the artist who painted in on top of the original painting to better depict the atmospherics and lines of the ship. Charles II's magnificent flagship was a 100 gun 3-decked line of battleship. Built in Chatham, England, and launched in 1682, the Britannia was the biggest ship of Charles II’s 30-ship program. She was originally designed by Sir Phineas Pett with a beam in excess of its specifications by 16” in order to balance a heightened main battery. The Admiralty rejected the increased beam width, although they kept the heightened battery. As a result, it was not until her commissioning several years later, when, loaded with weaponry, it was discovered that she was too top heavy to fight. She was withdrawn from service and returned after being fitted with a girdle of fir that increased her beam width from 47’ 4” to 48’ 8”. Pett's Sixteen inches. When she did return to service, in 1692, it was as Lord Russell’s flagship, where she engaged in direct combat with the French prized flagship Soleil-Royal, serving under Conte de Tourville.